Cape Verde with its capital Praia is located in Africa (Western Africa, group of islands in the North Atlantic Ocean). It covers some 4,034 square kilometers (slightly larger than Rhode Island) with 560,899 citizens. Portuguese is the language commonly spoken used in Cape Verde. This country shares no land borders with another country. Cape Verde is a country in West Africa. It comprises a group of islands of the Atlantic Ocean, west of Senegal. It is part of the region of Islands collectively known as Macaronesia. Most Cape Verdeans have both African and Portuguese antecedents. Cape Verde’s climate is temperate, with a warm, dry summer. Precipitation is meager and very erratic. 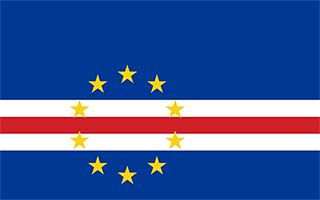 If you are arriving from a country with a Cape Verde embassy, you will be required to purchase a Visa in advance. Timetables in Cape Verde are not to be taken too seriously - don't be too surprised if that boat departs ahead of schedule or if that flight suddenly gets postponed until tomorrow. This is important to consider if you decide to do some island-hopping. The official language is Portuguese, used in all official publications and announcemnts as well as in business, media and schools, but the local language is Cape Verdean Creole. The landscape is steep, rugged, rocky, volcanic. The average density of population is about 139 per km². The climate in Cape Verde can be described as temperatewarm, dry summer, precipitation meager and erratic. Potential threats by nature are Fogo (elev. 2,829 m), which last erupted in 1995, is Cabo Verde's only active volcano, prolonged droughts, seasonal harmattan wind produces obscuring dust and volcanically and seismically active. To reach someone Cape Verde dial +238 prior to a number. The local cellular networks are operated on 900 MHz, 1800 MHz, 3G, 4G. Websites typically end with the top level domain ".cv". If you want to bring electric appliances (e.g. battery chaarger), keep in min the local 230 V - 50 Hz (plugs: C, F). The sign for the locally used currency Escudo is CVE. Five unequal horizontal bands; the top-most band of blue - equal to one half the width of the flag - is followed by three bands of white, red, and white, each equal to 1/12 of the width, and a bottom stripe of blue equal to one quarter of the flag width; a circle of 10 yellow, five-pointed stars is centered on the red stripe and positioned 3/8 of the length of the flag from the hoist side; blue stands for the sea and the sky, the circle of stars represents the 10 major islands united into a nation, the stripes symbolize the road to formation of the country through peace (white) and effort (red). The uninhabited islands were discovered and colonized by the Portuguese in the 15th century; Cabo Verde subsequently became a trading center for African slaves and later an important coaling and resupply stop for whaling and transatlantic shipping. The fusing of European and various African cultural traditions is reflected in Cabo Verde’s Crioulo language, music, and pano textiles. Following independence in 1975, and a tentative interest in unification with Guinea-Bissau, a one-party system was established and maintained until multi-party elections were held in 1990. Cabo Verde continues to sustain one of Africa's most stable democratic governments. Repeated droughts during the second half of the 20th century caused significant hardship and prompted heavy emigration. As a result, Cabo Verde's expatriate population is greater than its domestic one. Most Cabo Verdeans have both African and Portuguese antecedents. Cabo Verde’s population descends from its first permanent inhabitants in the late 15th-century – a preponderance of West African slaves, a small share of Portuguese colonists, and even fewer Italians, Spaniards, and Portuguese Jews. Among the nine inhabited islands, population distribution is variable. Islands in the east are very dry and are only sparsely settled to exploit their extensive salt deposits. The more southerly islands receive more precipitation and support larger populations, but agriculture and livestock grazing have damaged their soil fertility and vegetation. For centuries, the country’s overall population size has fluctuated significantly, as recurring periods of famine and epidemics have caused high death tolls and emigration.